When I first saw the list for Project Sewn weekly challenges, I was most excited about this final week. What is not to love? 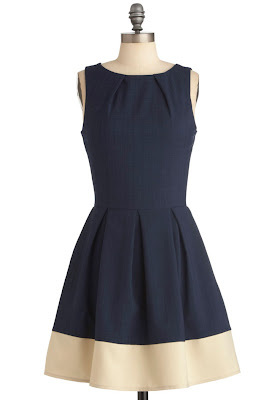 Navy blue with cream, pleats, a lovely silhouette...I had to have it. (oh, and it has pockets...awesome!) So I set out to make it. I bought 4 yards of some inexpensive navy blue cotton from Joanns. It was only $2 a yard (not the highest quality, but I wasn't sure if it would turn out). Then I bought the cream broadcloth (3/4 yd for a couple bucks too.) So armed with $10 in fabric, a heavy metal separating zipper, and 2 patterns from my stash I got started. For the bodice I used Butterick 4443. I cut a size 10 and ended up taking it in quite a bit at the chest. I had made this before and found it to be too baggy in the bust. (poor me :( haha) The only downside is I ended up losing the pleating detail at the neckline. I tried to make it work...but it just didn't fit with this pattern. For the skirt portion I used McCalls 5591. I used view C and made a view alterations. I cut a 12 and ended up losing quite a bit of fabric to make it work. Similar to the inspiration dress, I lost one pleat in the back and made only two. I also did not use the yoke pieces for the pattern. It took a lot of seam ripping and basting to get the top and bottom pieces to line up correctly, but in the end I am happy with it. I cut off about 4 inches from the hem and added a strip of cream broadcloth at the hemline. I tried a new technique with this dress called bagging the lining (or I think that is what this technique is called). I had pinned a link to it and decided to give it a go. I really enjoyed it and it worked great. It helps eliminate a lot of the hand stitching which is always a plus in my book. In the original dress there is no lining, but I added one to the bodice. If I would have had enough fabric I would have done one for the skirt as well, but a slip will have to do. I am really excited that this dress turned out. In the future, I will have to trust my sewing skills more and allow my pocket book to be stretched for better fabric or find a fabric store to send me some free samples...anyone, anyone? Please stop by Project Sewn to see all the lovely looks people are creating. That is amazing! I thought you bought the actual dress! What a perfect, classic dress. 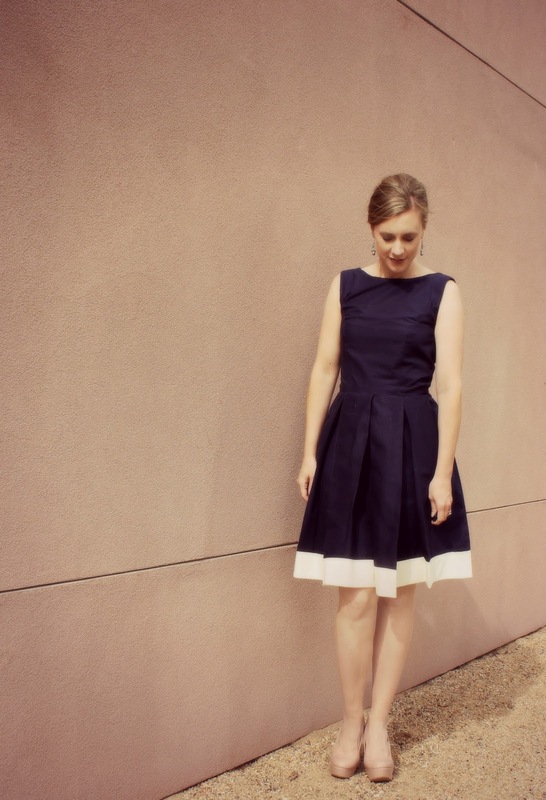 Although I've always thought of myself as a "basic black" person, I am drawn recently to navy. Your dress is just darling. 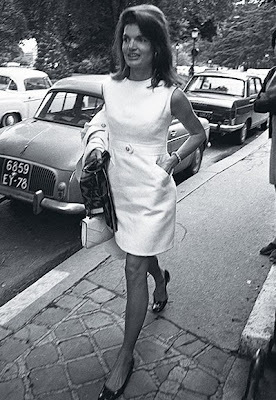 Isn't it amazing how although styles come and go, Jackie O is always chic?! The dress is gorgeous and it fits you vry well! Great job! Very pretty!! That is a dress I would buy. It's a beautiful dress, and it fits you beautifully too! Such a classic look and beautiful pictures. love it! Gorgeous! It turned out awesome! 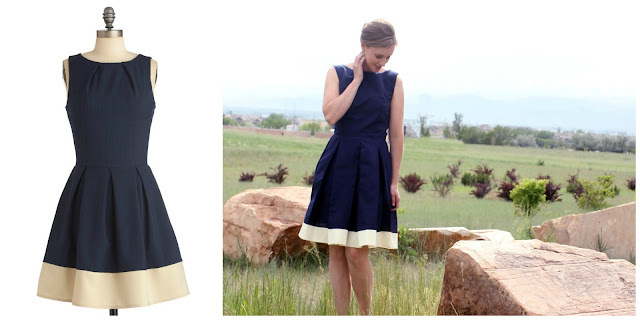 I love navy too, so classic, and never goes out of style. Beautiful dress! I love navy and classic, too. It is very cute, looks just like the Modcloth dress! If you find a way to get free fabric, let me know, haha. I will let you know...haha, wouldn't that be the best thing ever? It looks just like the original... I love your dress! Hi Shannon, I am visiting via Project Sewn, and I love your dress. I can't believe it is made out of broadcloth. You did a beautiful job! Turned out beautifully! Really love the exposed zipper and the colour blocking at the bottom! Good luck this week! Great knockoff! I like blue and cream, too. I LOVE this dress---it's something I would totally buy, wear, make, whatever! PS---Yesterday I just had to take in a dress that I was working on for myself...it was also too baggy in the bust line....boo. Omg. You look so adorable!! Love this dress and the inspiration! Wow, I have a dress that looks exactly like this, although in a different color <3 Love it!